The 10 Best Mountain Biking Trails in North Dakota! When it comes to mountain biking, North Dakota provides a truly unique terrain. While the state is mostly flat, it doesn’t mean you aren’t going to find a challenge. If you’re looking for a good trail to traverse, look no further. 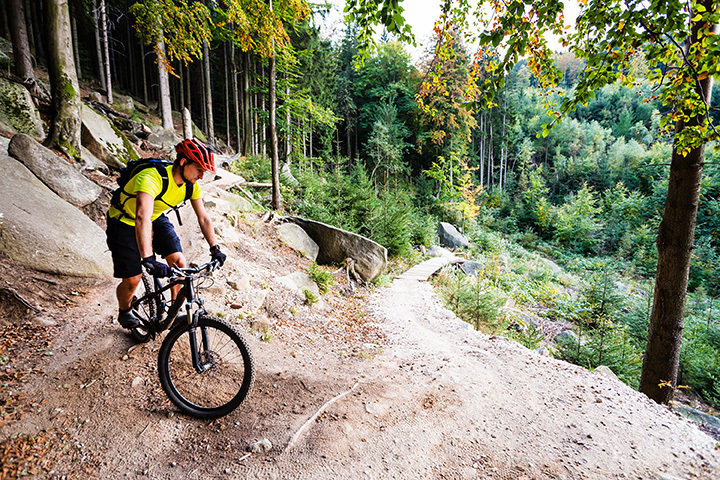 Here are the 10 best mountain biking trails in the state that will leave you challenged and satisfied! This eight-mile tight dirt single track uses the elevation variation caused by the Pipestem Dam to provide a trail with a moderate to high difficult level. Considered the best in the area, even experienced trail riders will find Pipestem to their liking. Harmon Lake Trail near Mandan is considered by many to be one of the best in the state. It is a 13.2-mile trail that has a moderate difficulty level. There are two loops available, one nine miles long and the other 4.2. The nine-mile trail takes you around the lake, giving you the opportunity to take in the natural beauty of the area. Home to some of the most beautiful and varied terrain, the Maah Daah Hey Trail is considered the gem of North Dakota. Not only does it have some of the most diverse elevation in the state, it will give you a chance to take in the animal and plants that call the state home. The 99-mile track is considered intermediate as far as difficulty and will give you a run for its money. Located on the edge of Teddy Roosevelt National Park, Long’s X Loop is a 12-mile trail that is rated as intermediate. It is one of the state’s lesser known trails, which will give you the opportunity to ride it with few distractions. The trail includes some elevation change. Located within the gorgeous Turtle Mountains, the Lake Metigoshe State Park Trail is as challenging as it is scenic. The trail consists of four loops totally 8.5 miles in length. The trails can be used by hikers, mountain bikers, or cross-country skiers, so it is one of the busiest trails in the state. This six-mile trail is located near Lake Sacajawea in western North Dakota, giving riders a beautiful backdrop with which to ride. Although there are a few hills, here is minimal elevation change. Considered an easy trail, Nux Baa Ga is suitable for all ages. Located in the Sheyenne National Grasslands, the North Country Trail is perfect for those on the eastern side of the state who are looking for a challenge. Although there is virtually no elevation change, the 25-mile trail does have the length necessary test even the most experienced rider. Per advice found on its website, don’t harass the cattle. This 7.5-mile trail takes advantage of the Turtle River’s natural beauty to give you a ride you will remember forever. Some areas of the trail are heavily wooded, giving riders an extra challenge. Expect to see wildlife as you ride this moderately challenging trail. If you are looking for a challenging trail, head to Bismarck. This 14-mile trail is considered one of the best in the area due to its unpredictable nature. Expect bumps and crevices that can change in accordance with the weather. The trail is looped like a tapeworm, with steep embankments and natural ridges. A 10.7-mile track that is great for beginners or for those that aren’t in the mood for an overly challenging ride. There is some elevation change, but most of the trail is straight single track. The trail loops around Jamestown’s wild buffalo herd. If you manage to see White Cloud, the revered albino buffalo, legend has it that you will received good luck for life.